Good communication with customers is key, no matter what industry you represent. If there are breaks in this communication, you’ve got yourself a problem. Even when planning a vacation or your Holiday leave, you should think of the communication and take care of it by setting up an out of office message. An out of office message is an automatic pre-made response that you set up to cover for you while you’re away from the office. Whenever you’re traveling, on holiday or you’re expecting a longer ‘break’ from monitoring your inbox, you should set up an out of office message to make sure that your customers don’t wait for responses that won’t come anytime soon. You can set up an out of office message in the settings of your email client. This can be done both on desktop as well as in web clients. 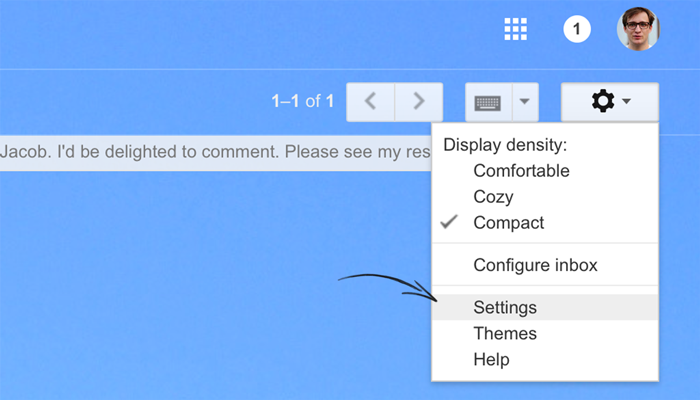 Go to your email Settings by pressing the cog icon. Configure the message and set the date when it should start appearing automatically (First day option). Flip the switch and activate the Vacation responder. After the set up, you can start enjoying your vacation. If you don’t set and enable the Last day date, the out of office email will be sent indefinitely until you deactivate it manually. It’s easy to forget about it, especially after a longer leave. This is why you should make it your top priority to turn it off after you come back to work. Make a note, ask someone to remind you because you don’t want the autoresponder message to be sent out after you come back. Use these out of office message good practices to write repliess that are helpful for customers and also to you when you get back to work. I'm currently not in the office. I will reply to you once I come back. The out of office message has to be useful. And one of the easiest ways to do that is by adding some information about your planned return date. 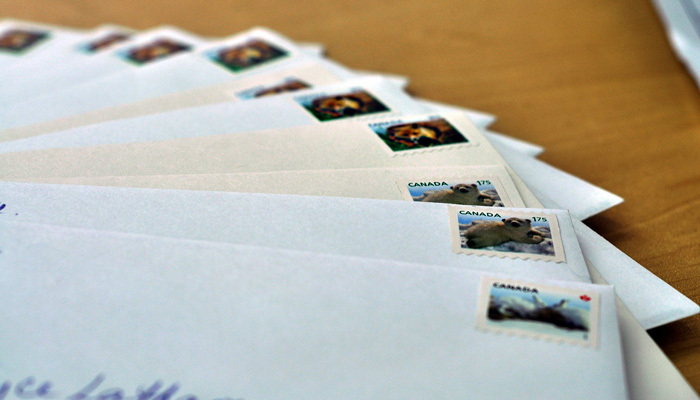 This way when someone writes to you, they should either be able to reach you again at the set date or know that they can expect a response from you around that time. I'm currently traveling and can't respond to your email. I will be back in the office on 21st of November and you can expect my response shortly after that. Not all customers will be able or will want to wait for your return. Some cases are more urgent than others and will require an immediate response. You should always offer an alternative way of contact for customers who don’t want to wait. Designate a colleague and name them in the message (while also providing their email address) to offer a contact option for customers who can’t wait. Just make sure to notify the colleague beforehand if you don’t want to cause a lot of confusion and even more trouble for your customers. Instead of designating a single person, you could also provide an alias for a group email that would reach several people working in your company. For example, sales@fastrepairs.com. However, these kind of emails tend to end up without an ‘owner’ who would feel responsible for them. This is why designating a single person is the safer option. For urgent cases, please contact Steve who works in the same department at steve@fastrepairs.com and he will be able to help you out. People who write to you do it for a specific reason. If you can anticipate and predict that reason, you can offer an immediate solution instead of letting them know that they should contact you at another time or that they should contact someone else. For example, if potential customers contact you often to get a quote for your services, you can create a web form that will gather all the necessary information and generate a quote for them. Another example would be to send your customers a direct chat link so they could get responses in real-time (you can test LiveChat for 30-days and see the results for yourself). direct customers asking for help straight to the knowledge base section on your website. 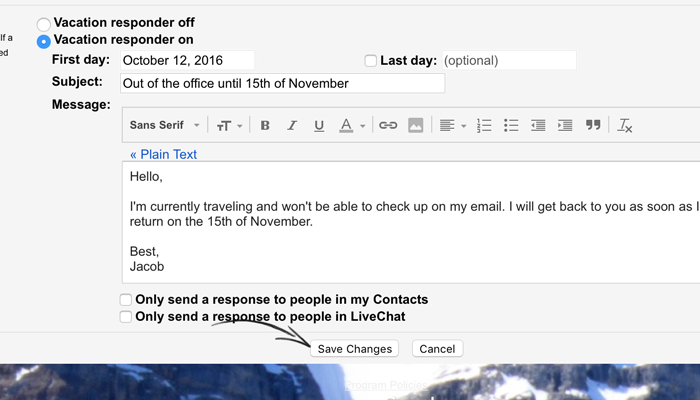 Check what kind of emails and questions you get all the time and try to address that with our out of office message. If you're contacting us because you need a quote for our services, you can use our quote generator website to get it immediately. Just because you’re not in the office, it doesn’t mean that you can’t bring in more customers. Your out of office message can become one of your lead generation strategies. Adding a short pitch at the end of your out of office message will allow you to make sure that you’re using all the chances to net a new customer. A bit of information about your products or services might be just the thing that adds another qualified lead to your funnel. And if they are contacting you directly, there’s a pretty good chance that they want to do some business with you. You might be able to interest the visitor enough to have them go to one of your landing pages or product listings. And if you'd like to simply learn more about the amazing results we bring with our services, check out our customer stories for some extra information. What are your go-to methods for writing an out of office message? Do you think anything else should be added to our list? Maybe we should include funny out of office messages? Feel free to add your favorite out of office ideas in the comments section or tell us what you would change in the out of office message we created. Photo courtesy of Flood G. via Creative Commons.